With people nowadays being infatuated with YouTube, Google Videos, Metacafe, etc, the frequency of running into FLV file extension is on the rise since a majority of video contents available on the web is published in FLV format. But for those who'd like to watch the downloaded FLV video on Mac or mobile devices, problem follows because video recognized by your Mac computer or iPhone, iPad would be of absolutely different format. To avoid potential difficulties of playing YouTube FLV video on Mac, iPhone, iPad, and other smartphones, the very idea is to seek for an FLV to MP4 converter for Mac to transfer YouTube FLV to MP4 format accepted by your Mac, mobiles or tablets previously. Free FLV to MP4 Converter for Mac? Where to Find Such a Good FLV Converter? Certainly, you have an unlimited choice of finding such FLV to MP4 converter for your Mac platform. But dazzling converter programs still cannot stop us finding the most appropriate software. Generally the cheaper the better. And remember the best Mac FLV converter, while claiming it's 100% free, shall also deliver gorgeous video picture and make the conversion on Mac as easy as possible. Keep these factors in mind and you can benefit a lot, whether you are wondering a transcoder for Mac or other programs. 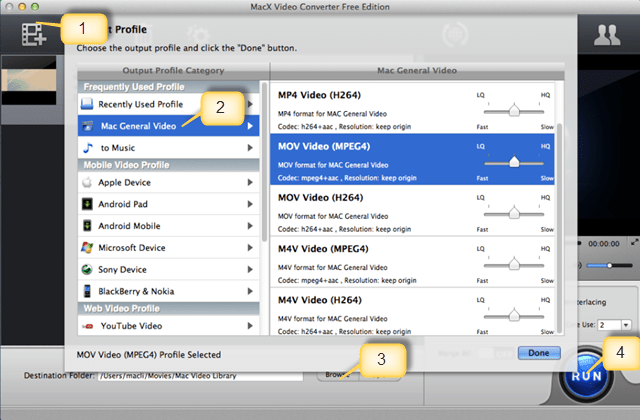 Here, I strongly recommend you MacX Video Converter Free Edition, which serves as a professional yet totally free FLV video to MP4 converter for Mac users to transfer from FLV video to MP4 format on Mac for free, so that you can play YouTube FLV video on Mac bundled QuickTime player, manage FLV in iTunes to be synchronized to iPhone iPad iPod, and even import FLV files to iMovie for editing further. This tool also supports free converting FLV video to MOV, AVI, MP3 and offers optimized output profiles for iPhone, iPad, iPod, Blackberry, Android, and many more, all getting video conversion done on Mac in a flash with excellent video quality. Below is the step by step guide on how to decode and encode FLV video to MP4 format on Mac. After free download FLV converter on Mac, launch it and load the FLV files by hitting "Add File" button. BTW, MacX Video Converter Free Edition supports importing almost all video formats such as FLV, MP4, MOV, AVI, AVCHD, MTS, MPEG, WMV, MKV, etc. To free convert FLV to MP4 on Mac, you can simply hit "to MP4" button in the output format area. Click the "RUN" button to start free processing FLV format to MP4 format on your Mac computer, you could view the conversion progress and are able to cancel the converting process at anytime. By the way, for those who are willing to get more video conversion on Mac and download YouTube videos for watching on iPhone, iPad, iPod offline on the move, MacX Video Converter Pro gives a hand and finishes all tasks perfectly with a wink. The Swiss Knife for online FLV downloading and converting software. Download FLV/WebM/MP4from YouTube, Facebook, Dailymotion and 300+ online sites and convert FLV to MP4, MOV, AVI, MKV, etc with fast speed, 5x faster than competitors.